Amongst Hindu gods and goddesses, Murugan has been given pride of place. This is particularly evident in the southern parts of India and some countries in the Far East where Tamil-speaking people form a significant segment of the population. The word "Murugu" signifies beauty and thus Murugan means "the beautiful one". Murugan 'arrived' on this planet as the son of Lord Siva, as the younger brother of Lord Ganesa and as the nephew of Lord Narayana. He is venerated as Kaliyuga Varada, the God who blesses and protects those who ardently seek His grace. 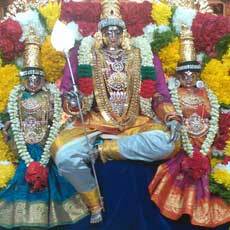 The form of Murugan with his consorts also serve to explain the 3 main Shaktis he possesses. Valli represents "Icha Shakthi", Theivanai represents "Kiriya Shakthi" and the "Vel" or spear he holds represents "Gnana Shakthi". The three integral elements of Muruga's personality are spear(vel) in His hand, peacock as His mount and cockerel adorning His banner. The peacock displays the divine shape of Omkara when it spreads its magnificent plumes into a full-blown circular form, while the cockerel proclaims loudly the Pranava sound OM. Muruga shines as the very essence of the Vedas and Mantras.